KENT, O.H. 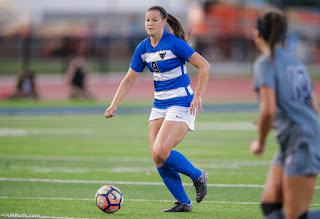 -- The University at Buffalo women's soccer team (9-3-0, 3-2-0 MAC) allowed five first half goals and fell on the road to Kent State, 5-2, on Thursday night at Dix Stadium. Kaitlyn Walsh and Gianna Yurchak netted second half goals for the Bulls as they fell to 3-2-0 in MAC play. The Golden Flashes were able to record the first shot of the match just 25 seconds into action as Maddie Holmes took a shot from distance that was snagged by Emily Kelly. After another Kent State shot that went high, the Bulls were able to notch their first shot of the match in the 10th minute as Hannah Callaghan took a shot that went wide of the Golden Flashes cage. Kent State scored their first goal of the first half in the 20th minute as Isabelle Mihail took a feed from Cameron Shedenhelm and beat Emily Kelly from 10 yards out. Just over a minute later, Kent State took the 2-0 lead as Maddie Holmes headed home a ball after a misplay by the UB defense. In the 24th minute, Katherine Camper had a good scoring chance for the Bulls but she saw her attempt saved by the Kent State keeper. Dominique Dinardo gave the Golden Flashes the quick 3-0 lead in the 27th minute of play as she grabbed a deflected ball and beat Emily Kelly as she was in all alone with the UB keeper. A couple minutes later, the home side made it 4-0 as Isabelle Mihail netted her second goal of the half after a feed from Cameron Shedenhelm. Khyla Porter capped off the first half scoring for Kent State with a rocket of a goal into the upper corner from 25 yards out, beating the outstretched arm of Emily Kelly. Buffalo opened up the second half with their first goal of the match in the 50th minute as Marcy Barberic sent a cross into the box where Kaitlyn Walsh got her head on the ball and it beat the keeper for her fifth goal of the season. In the 58th minute, Kaitlyn Walsh had another good scoring chance but her shot was saved by the Kent State keeper. Sarah Bykowicz made her first save of the game in the 65th minute as she snagged the shot off the foot of Isabelle Mihail. After some back-and-forth play, the Bulls were able to make the score 5-2 in favor of the Golden Flashes as Gianna Yurchak found a loose ball and buried her second goal of the season. Gurjeena Jandu sent a great corner kick into the box where Hannah Callaghan headed the ball to Yurchak who beat the Kent State keeper for the goal in the 79th minute. In the 85th minute, Sarah Bykowicz made another save for the Bulls as she started the second half for the first time in her UB career. With the loss, Buffalo is now 2-3-0 against the Golden Flashes over their last five meetings. Kaitlyn Walsh collected her fifth goal of the season, a career-high, in the loss to Kent State. Gianna Yurchak netted her second goal of the season in the second half for UB. Sophomore Marcy Barberic picked up her career-high sixth assist of the season on Walsh's goal. Kent State held the 19-6 advantage in shots and the 4-2 edge in corner kicks in the game. Katherine Camper and Kaitlyn Walsh led UB with two shots each in the loss. In goal, freshman Sarah Bykowicz played a career-high 45 minutes and finished with a career-best four saves while not allowing a goal in the loss. Head Coach Shawn Burke: "We lacked leadership and heart tonight and a good Kent State team punished us for it. We can't wait to be in a deficit to start playing with the energy and effort it takes to be successful at this level. If we learn to play 90 minutes we can turn this around but if not, it will be a long six games for us." Following the match, the UB coaching staff selected Sarah Bykowicz as the Player of the Match after her strong second half in goal as she made four saves and didn't allow a goal. Buffalo will return home on Sunday afternoon as they welcome the Ohio Bobcats to UB Stadium for a 12:00 pm kickoff. The first 200 students in attendance on Sunday will receive a free UB Bulls Buff.